Congratulations to our new directors! This year's AGM also included a detailed overview of the work of your Association over the past year. That report can be downloaded here. The SLNA was on the Stakeholder Advisory Committee that established the King Street Pilot. Our SLNA membership supported the effort and now your feedback on the pilot is needed. A final report from the City about the King Street pilot is set to come out next week and will include an evaluation of the project's success and recommendations on how to move forward. The report will be presented to City Council's Executive Committee and the TTC Board before going to City Council for a vote. This means that the future of King Street, and the fate of the transit priority measures put in place through the King Street Pilot, will be decided over the next three weeks by City Council. Before the King Street Pilot was introduced, taking transit on the busiest surface route in the city was unpredictable. It was often faster to walk. The year-long pilot has provided faster, more reliable transit that makes the street work better for everyone. It has also boosted transit ridership by over 10,000 passengers. The TTCRiders group is sponsoring a workshop on April 4th, 6 p.m., at 401 Richmond St. W., Room 372. The venue is accessible, snacks and refreshments will be provided and tokens are available. The City is in the process of designing a new 25,000 sq. ft. community centre at 261 Queens Quay East to be located at the base of a mixed-use building within the future Hines/Tridel development site. Come to a community meeting to collaborate with the project team on developing th future community centre design. See more details on the attached Notice from the City of Toronto. Please download, print and share the SLNA April Seniors' Activities Calendar with your neighbours. Delegates please print and post where possible. The Creative Aging Circle in collaboration with the Performing Arts Lodge (PAL) presents a Music and Movement for Health FREE workshop for Seniors on Wednesday, April 10 from 2 - 4 pm at the Performing Arts Lodge, 110 The Esplanade. The Seniors' Committee has also arranged for reserved seating for another FREE noon time concert at Roy Thomson Hall on Wednesday, April 17. Download the Roy Thomson Hall Concert Flyer for details. 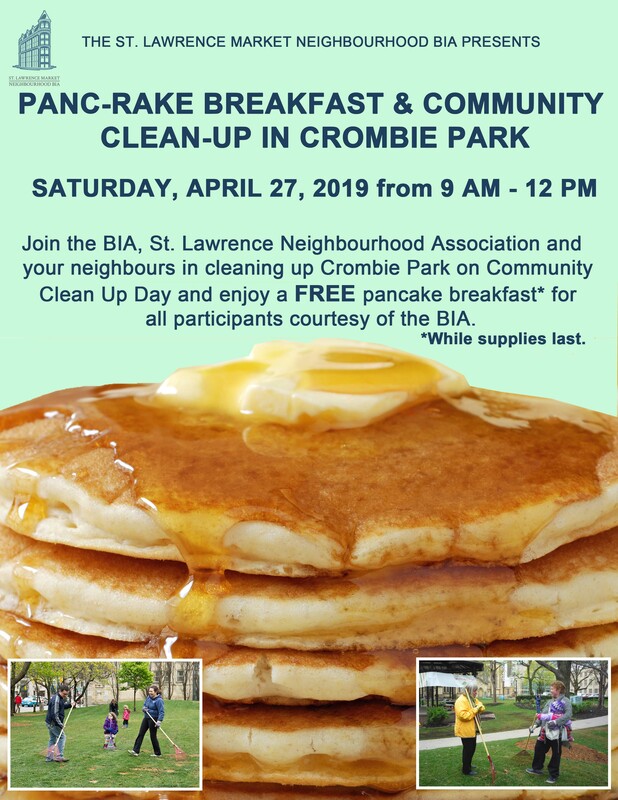 Join the St. Lawrence Building Improvement Area (BIA), the SLNA and your neighbours in cleaning up Crombie Park on Community Clean Up Day and enjoy a FREE pancake breakfast (while supplies last) for all participants courtesy of the BIA. Download and share the Panc-Rake Breakfast Flyer. 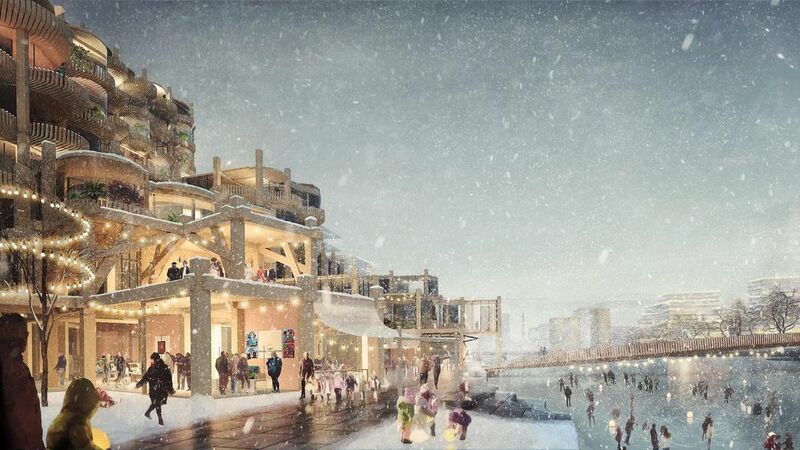 The City of Toronto is hosting a Community Consultation Meeting for the proposed development at 1 Front St. W on Monday, April 1, 7 - 9 pm a tthe Novotel Hotel, 45 The Esplanade, Champagne West Room. Download the Consultation flyer for details. Toronto Life magazine describes our neighbourhood's very own East Thirty-Six restaurant as one of the city's favourite cocktail bars "with a serious kitchen." If this sounds like your ideal location for brunch, read on. NOTE: the promotion is limited to 1 complimentary mimosa or caesar per person, no limit on the number of people at a table. To learn more, view the East Thirty-Six menu. East Thirty-Six is located at 36 Wellington St. East. 647-350-3636. This year we invite local businesses to become official sponsors of the SLNAs new Canada Day Sponsorship program. The SLNA Canada Day Parade and Picnic is the SLNA's premier event of the year and includes a parade and picnic hosted on the grounds of the historic St. James Cathedral. To get more information about the sponsorship program, please click here. In November 2015, a groujp of St. Lawrence community members and St. James Cathedral parishoners, gathered to respond to the Syrian refugee crisis. It has been a fruitful alliance! To date we have sponsored a Syrian family of five and a father and daughter from Iran. Through Canada's unique blended visa program, we support these newcomers financially, practically, socially, and emotionally during their first year of resettlement. As we look to sponsor a family this year, we seek volunteers and committee members from the St. Lawrence community. If you are interested, visit the St. James Cathedral website to find out how you can get involved. 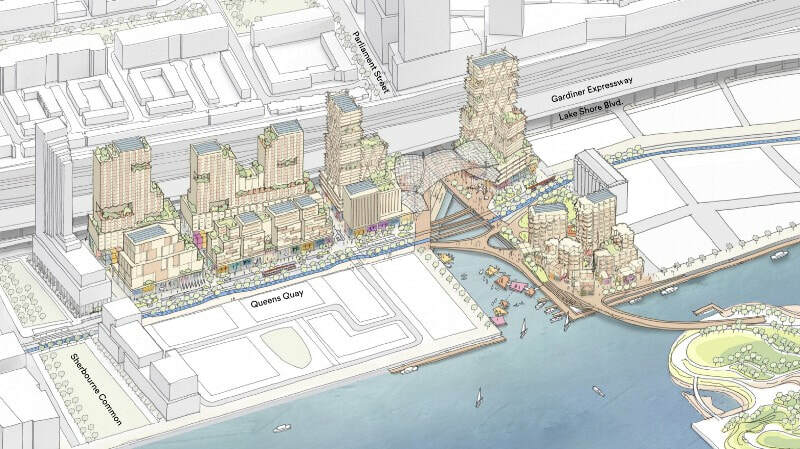 The SLNA looks forward to welcoming Waterfront Toronto and Sidewalk Labs at our next Delegates and Community meeting scheduled for Wednesday, Februray 27, from 7 - 9 pm (meeting registration at 6:30 p.m.) at 115 The Esplanade (enter code 246 to gain access). Our key presenters will be discussing the proposed Quayside development and questions from our SLNA members. To view the full agenda click here or view the calendar on the home page of this website (scroll to the bottom). 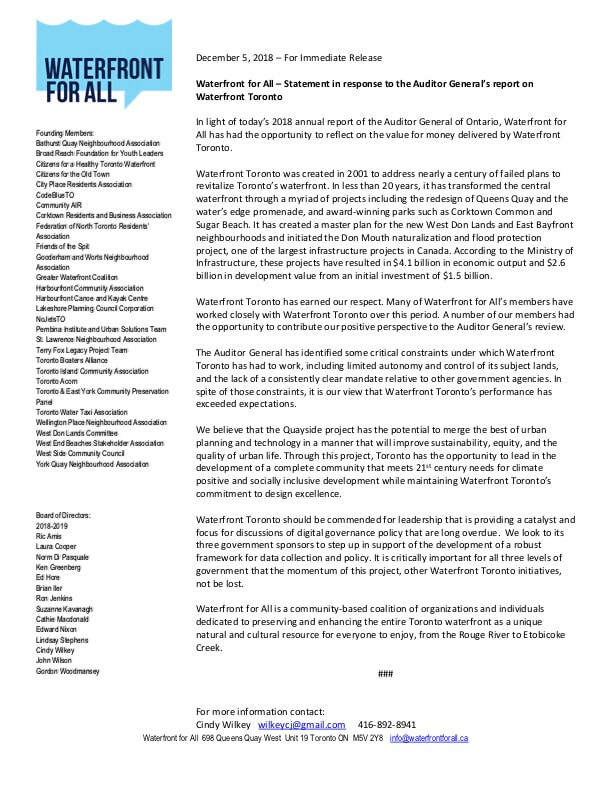 In response to the recent Auditor General report on Waterfront Toronto, the St. Lawrence Neighbourhood Association as an association that has worked closely with Waterfront Toronto for many years and is a founding member of Waterfront for All, commends the leadership of Waterfront Toronto. The organization is aligned to the values and priorities of the SLNA and we support the recent statement and position released by Waterfront for All. See below. 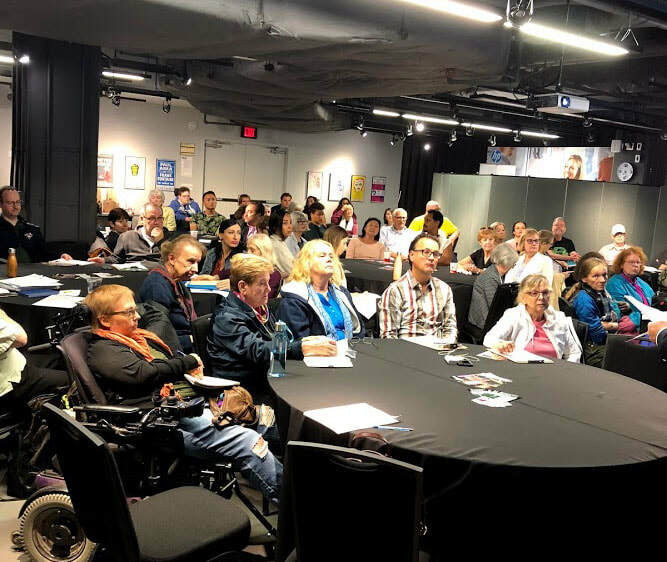 We had a packed agenda and room at our Nov. 28 SLNA Monthly meeting. In addition to discussing our important SLNA traffic audit highlighting the most dangerous intersections in our neighbourhood (thank you SLNA Director Sabina Soromova and all volunteers) we also welcomed to our meeting one of our two new Councillors - Ward 13 Councillor Kristyn Wong-Tam who shared her depth of knowledge on a number of our priorities from parks to heritage preservation. We look forward to working with our Councillor who definitely has a clear and amplified voice on Toronto’s City Council. The Feast of St. Lawrence begins in spectacular fashion on Friday, August 10th with an exclusive, al fresco fine dining event for charity. Two hundred and fifty guests will be seated at two continuous tables on Front Street (between Scott and Church Street) and served a sumptuous 5-course dinner prepared by chefs from some of the top restaurants in the St. Lawrence Neighbourhood including Biff's BIstro, Farmr, ARDO, The Hot House Restaurant, Omni KIng Edward Hotel, Pearl Diver, The Sultan's Tent and George Brown College. Wine pairings from Prince Edward County vineyards and Creemore Springs beer will be served with the dinner and CC Lounge will present a special Whisky tasting bar. The 18-piece JAZZ.FM91 Youth Big Band will provide added ambiance in the beautifully illuminated Berczy Park lounge area. The event begins with an hors d'oeuvres, wine and beer reception at 6:00 p.m. and ends at 11:00 p.m. A portion of ticket sales will be donated to Second Harvest. Join us on Saturday, August 11th for our Market Street Celebration. We celebrate the world famous St. Lawrence Market and Market Street with outdoor food stalls and seating areas, farm fresh produce, live music at the Audi FEAST Stage, a pig roast from the Farmer’s Market, kids entertainment, games and activities at the FEAST for Kids sponsored by TD Bank Group, and much more! The event runs from 10 a.m. to 7 p.m. and admission is free. 4pm – Sol de Cuba – Salsa lesson by Soul2Sole before the band at 3:40pm! ​Some of the best Canadian artists play at the Distillery District's Trinity Square stage (enter at 55 Mill St.). Darling Cora is an indie-folk singer-songwriter whose music blends and bends genres to create songs that touch the head and heart. With a supple voice brimming with soul and grace, thoughtful lyrics, and a unique guitar playing style, her songs capture emotional truths. Both raw and refined, the songs aim to prompt listeners into feeling and experiencing the beauty and range of the human condition. She's also known for her open, and sometimes mischievous, stage banter. Steven Taetz has performed in Carnegie Hall(NYC), Rockwood Music Hall and The Bitter End (NYC), Hotel Cafe (LA), Blue Room (Korea), Capital Pride (Wash DC), Ironwood (Calgary), House of Jazz (Montreal), and in Toronto’s Rogers Stadium, The Rex, The Jazz Bistro, Hugh’s Room, and many more. He has released music internationally, charted for radio play and sales, and released his first studio album with collaborations from JUNO-winning artists from across Canada. Following a holiday EP in 2017, he is developing his sophomore album for release in 2018 with noted award-winning collaborators, and North American touring dates to be announced. His work has received rave reviews from industry taste-makers. On Sunday, August 12th, Dauntless Theatre Productions is back in Berczy with a new Shakespearean comedy. Take centre stage in this immersive* theatrical experience that is unique in the downtown core. Organized by the St. Lawrence Marketing BIA. The recent decision by the Ford government to amalgamate ward boundaries and cut the size of Toronto's City Council by almost half in the middle of the CURRENT municipal election season is a strike against the voice and fair representation of Toronto residents. This is especially detrimental to those living in downtown Toronto's core neighbourhoods - neighbourhoods like ours. As we looked for candidates to speak out on this issue, the first candidate noted was Ward 21 Candidate and former SLNA President, Suzanne Kavanagh. ​ Please see her news release below. Current Ward 21 candidate Suzanne Kavanagh opposes Ford’s plan to cut Toronto Council in half and is planning recourse. Kavanagh plans to fight this brazen decision. For interviews or additional information, contact Campaign Manager Aaron Binder at aaron@suzannekavanagh.ca.